DeWayne Davis is a singer, bassist, multi-instrumentalist, and published song writer who has played all over the USA, and in Europe and Japan. DeWayne was immersed in The Austin Blues scene throughout the late 80's and 90's, sometimes playing seven nights a week, with countless artists. He has also fronted his own band, since 1991. 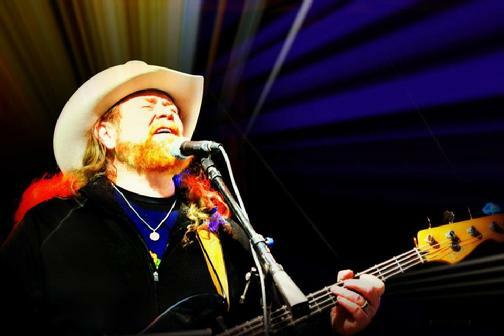 DeWayne incorporates Texas musical styles- Blues, Country, Latin, and Roots rock into his shows, playing about 50 original songs. "DeWayne blares out lead vocals reminiscient of Greg Allman and Ronnie Van Zandt! Davis, who's gotta be eight feet tall, has that pounding Bass rythm so necessary for Blues, and a voice that just won't quit. More than that even, he's a presence on stage....A bluesy Goliath with loads of attitude!" "A prolific composer, DeWayne Davis has honed his craft the hard way, by playing in front of those gnarly but appreciative Texas music fans." "...the sliding, gliding, smoothness of electric bass player DeWayne Davis." "DeWayne Davis' swinging bass line is the foundation of this musical house...with a good clean voice." "DeWayne Davis rolls and pops some impossibly fast but ultra-smooth lines on his electric bass, preforming intricate riffs that would please shredders and jazz-rockers alike."